To say this offseason was noteworthy is an understatement. The creation of the Bass Pro Tour and the subsequent shifting of anglers between the now three major-level tours was something that shook up the entire sport. Everyone has needed to evolve and adapt, Bass Rankings included. 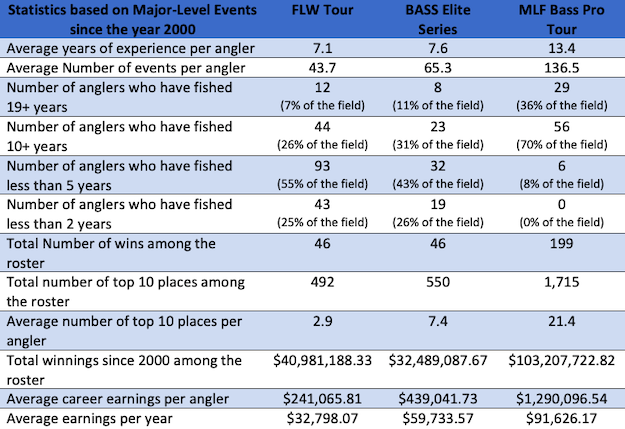 The three-major-level-tours landscape has added a new dynamic to statistically and unbiasedly comparing anglers from one tour to another. 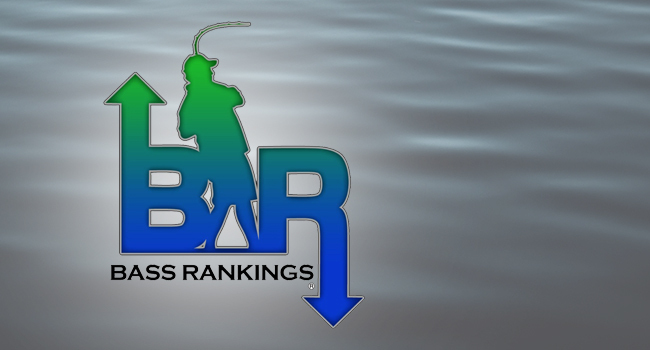 Thus, we have recognized a need to adjust our ranking algorithm to continue to rank anglers in an unbiased manner. In addition, we have added back-end coding to allow us to run analytics on angler rosters to better understand the differences (experience level, technique-specific, etc.). Below are results from our analysis for the rosters of the three major-level tours. These statistical comparisons, in no way, are meant to be an expression of bias to any trail, but merely the current status of the anglers on each roster. NOTES: Anglers have readily switched trails throughout their careers, and thus, their experiences may not have been entirely gained from the organization they currently compete. Also, these averages only include tournaments dating back to 2000, as this is as far back as we have data across all trails that we are able to track accurately. As you can see, each trail is different in its own accord. Thus, our new algorithm has been updated to take this into consideration. It factors in veterans vs new anglers on each tour, while at the same time giving new anglers an opportunity to shine. As always, there are no bonus points; the algorithm is 100% statistical, simply accommodating the differences in the rosters of each tour. The end result allows our rankings to measure anglers across all three tours in a fair, just and sound way. As we said, we’ve all had to adapt. Yet, this offseason and the subsequent adaptations have created more opportunities than ever for anglers and fans to enjoy the sport as it continues to grow.